It's a pity you didn't make it PTT it was a great morning for it. Very runnable trails and a reasonably fast course for a trail run. I managed a 1:34:10 and it was a tad over 20kms. There's no real creek crossings so you shouldn't have to worry about wet feet unless you get a heap of rain. If you want a nice easy short run, the first loop of the 'Cotter Canter' course is a good one. The second part is hilly and more of a true trail run. The next trail race is the 'Gungahlin Gallop' 30km & 10km. The next trail race (in Canberra) is the 'Gungahlin Gallop' 30km & 10km. Yet another great trail run in a nice part of the world. You ACT folks are spoilt! Just put this on a thread in Trichat, but am feeling generous so I thought I'd share it here. We've still got a couple of rooms free (nothing flash) so might be able to offer you a free bunk for the night if you get in quick - and plenty of floor space if you don't. All you'll be up for is your entry in one of the events (1.5, 5, 10, 21, 42km, KOM or MTB Marathon) and your transport out here. Some of you know where I live, but for others that don't and are keen, just send me a message and I'll let you know my address and some details of the weekend. Note - I'll be fairly busy doing the 10k event on Saturday, the 21k on Sunday and helping out marking and marshalling the courses over most of the weekend, so you'll need to be able to look after yourself. Glad Wonderland was not on the weekend just past, lots of snow on the trail at the moment still after a substantial dump for the region over the weekend. The family are heading down to UTA next year. Wife did the 100 this year and will do it again but not enter until closer to the date as she always ends up injured if enters too early. I am going to do the 22 as someone needs to look after Miss 6. Signed up for the UTA 50. Suspect I should do some training for that one. The Hume & Hovell Trail Runs are on again at Tumbarumba this coming weekend. There are 22km, 50km, 100km, 100 Miler and Relay options for anyone that's keen on a bit of casual off-road action. Entries close tonight (sorry about the late notice, but I've been a bit absent lately). You can camp at the start/finish area so it's cheap weekend away in the bush if you don't mind roughing it a bit. Forgot all about this... I haven't entered anything yet as I'm a bit broken again and was waiting to see if they had enough volunteers. Thought that I might cruise the 22km again if feeling up to it but could probably struggle through 25km if needed. Not heading down this year. Liz broke seven bones in her foot while on a training run on Mt Solitary in June and has had to pull out of the miler, races in NZ and India and the Great Southern Endurance Run. Pins come out this Friday and training starts as soon as possible after that. She's like a bear with a sore head at the moment. Will be back for H&H next year, its a great low key event in a pretty speccy part of the world. Enjoy the weekend. The Bar Opens at 9.00am along with the Registrations, and they have Beer at the Aid Stations... Now we're talkin! . Bugger! What's the chances... When I said I'm broken again I've got what I think is a stress fracture in my 2nd Metatarsal (toe). Over the past 3 weeks I've only done a 3km, a 4km and a 5km run and thought that it was coming along alright. I did just over 10km tonight to test it a bit and have pulled up lame so I probably won't be doing anything either. Am tempted to have a go anyway, but don't really want to jeopardise some other events that I have coming up in the next couple of months. Good luck with the bear and her recovery, I hope it all goes well for her and that she's back enjoying the trails again soon! Cheers, I saw the Doctor (another runner) on Monday and she thinks it's more likely to be tendon damage rather than a stress fracture due to it's location. I've had an x-ray, which she thinks probably won't show anything anyway, and has suggested just self regulating and taking it easy for a while... Could be worse! . Anyone here done trail running over multiple days? Got an email yesterday about Run Larapinta which is on in the NT in August. I'm going to be OS when it comes around this year, but got me thinking overnight of adding it into my schedule for 2019. The question is, how much harder is it backing up trail runs day after day after day after day? I did the first Larapinta a couple of years ago and me and a mate are going back again this year. Backing up is not too bad, its just ticking a day off at a time. If you are worried there's two distances, do the shorter one first, but I'm sure you won't be tested and its only four days. The best bit is racing during the day, sitting back having a beer with everyone else and then dinner and awards for the day. You get a good chance to recover with a good nights sleep, a big brekky and are ready to go again the next day. The scenery is absolutely spectacular Stanley Chasm, Ormiston Gorge, are another world. Just be prepared for different surfaces, bit of sand, bit of rock hopping and a little bit of climbing. Did an 8 day stage race in Europe a few years ago in the Alps which was much longer and a fair bit tougher. Do it, its awesome fun. Rapid Ascent do great events. I have a 20km trail race on April 14th. Running with my neighbour, she is setting the pace. Looking forward to it. Gonna be muddy! Finished Mt Solitary Ultra the weekend before last. Highly recommended. "Only" 45km. 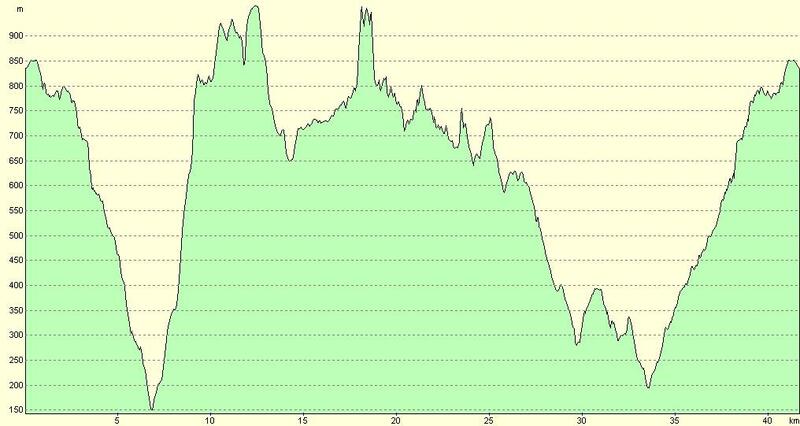 Someone said it has more elevation change the UTA 100km course. Backing up isn't hard if you prepare and train for it. Trails are generally softer on the legs, nor are you running as quickly as on road. Train with back-to-back days of significant mileage building into consecutive days. Manage your recovery (fluids, food, flexibility, etc) between stages. Eat as much as can, as often as can in your down time. You will have ample recovery time with few other priorities. Learn how to manage your feet. Prevent small problems from becoming large ones that can eventually screw up or end your run. Sunburn, chaffing, blisters are all avoidable. If these do crop up, attend to them early, don't try to run through or fix them later. If you're worried about restarting each day, you can always have a crack at Jess and MQ's FKT for Larapinta and just run straight through. They only took about 60 hours. Good luck to all the PTT's. I've gone off trail running myself but good luck! It's an event that I've been planning to do for a while. I believe there may be one or two other Trannies going around. Edit - Oops, just realised there's a UTA 2019 thread so I'll post there.